Dr. Chew Kia Ngee , BEc(Hons), MCom, PhD, FCA (Australia), FCA (Singapore), FCPA (Australia) was a Partner of Coopers & Lybrand, Singapore since 1978 and served as its Senior Partner and Executive Chairman from 1996. Upon the merger of Cooper & Lybrand and Pricewaterhouse in 1999, he was appointed Deputy Chairman. He retired from the firm at the end of June 2005. 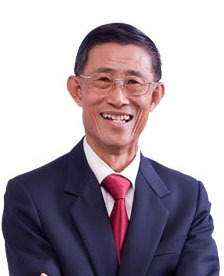 Dr Chew is currently on the Board of Haw Par Corporation Ltd, and is also Chairperson of its Audit Committee. Until the end of November 2014, he was also Chairman of Ausgroup Ltd. He also served previously as a Director of Datacraft Asia Ltd and Courts Ltd.
On the Community front, Dr Chew is a Director of the Singapore Eye Foundation and also serves on the Audit Committee of Kong Meng San Phor Khar See Monastery. Dr. Chew is a Fellow of the Institute of Singapore Chartered Accountants. He is a Fellow of the Institute of Chartered Accountants in Australia as well as a Fellow of the Australian CPA. Dr. Chew holds a Bachelor of Economics (Honours) from the University of Malaya, a Master of Commerce from the University of Melbourne and a PhD in Business and Management from the University of South Australia.